Ice cream goes with everything until it drizzles down your shirt. 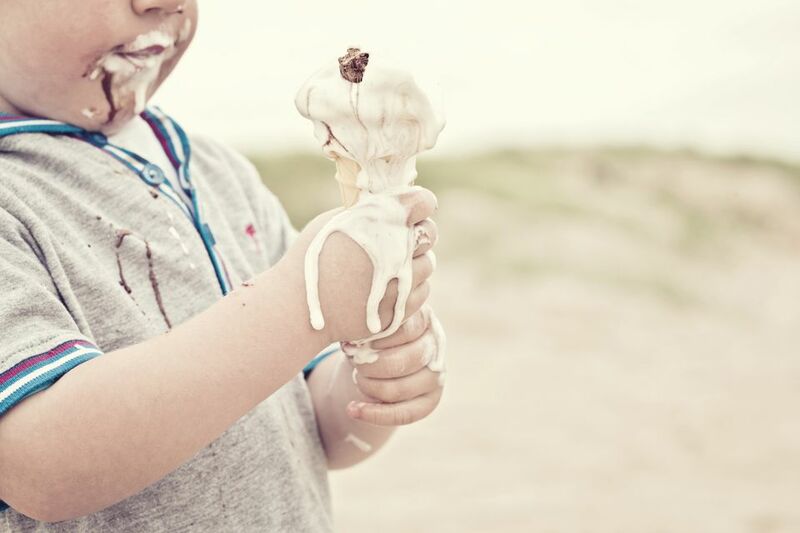 At first, ice cream may seem like a harmless stain but because it is protein based, it can be one of the most difficult dry stains to fully remove. You may think it is completely gone, but slowly a brown or yellowish ring will reappear on the laundry. If that area has already been dried in the dryer, you may have a very difficult time removing the stain completely from the clothing. These everyday household items are helpful to have on hand when you need to remove an ice cream stain. Treat ice cream stains as soon as possible for the best results. Put the stained fabric into cold water for 5 to 10 minutes or longer if the stain is dried. Avoid hot water which will set a protein stain. If you can still see any remains of the stain, rub liquid laundry detergent into the stained area and soak in room temperature water for 30 minutes. Rub the stain gently every few minutes. If you don't have liquid laundry detergent, try dish soap instead. After rinsing the clothing, add a stain remover to the stained area. Allow it to sit for 7 to 10 minutes before rinsing completely with cold water. Repeat the soaking and stain remover steps until no ice cream is left in the clothing. Be sure you don't see any remaining stain because once the fabric is dried, it will be nearly impossible to remove it. Proceed with washing the clothing according to the fabric directions. Try to remove as much of the dried ice cream as possible using a spoon or dull knife. Rub liquid laundry detergent into the stained area and allow the stain to soak in cold water for at least 30 minutes. Now you can begin the steps listed above for fresh stains. Do not dry the ice cream stained clothing in your clothes dryer until you are absolutely sure the stained area is fully gone. It's better to allow the item to air dry first. If the stained area still has a slightly yellowish or brownish area, repeat the stain removal steps as many times as needed. Putting the clothing in a dryer may set the stain forever, so you'll need to be sure it is fully gone before drying. Blot excess ice cream from the fabric, but be careful not to spread it and make the stain larger. Mix one tablespoon of dishwashing liquid with two cups cool water. Sponge the spot with this solution on a clean white cloth, then blot until the liquid is absorbed. Only wet the upholstery as little as necessary to remove the stain. Repeat this process until the stain is lifted. Once the stain is completely gone, use plain cold water on a new white cloth and sponge the area to remove the remainder of the cleaning solution. Blot dry.